GET THE POWER BACK IN YOUR CAR! ​Get the power back in your automobile with a car tune-up Malden, MA residents can depend on! Save gas with routine maintenance on your car. Traffic in Malden, MA is constantly stop and go so getting a tune-up is a smart idea that will prolong the life of your car. Most tune-ups we typically check hoses, belts, emissions, PCV valve, gas filter, air filter, engine oil, coolant, brake fluid, transmission fluid, and power steering fluid. Good Advice: Car Tune-ups are Important! Maintaining your car, SUV, truck or van with regular tune-ups is excellent advice. The technicians he at Eli & Gary's Automotive Services recommends a tune-up every 32,000 miles. If your vehicle is experiencing issues in performance such as stalling, lack of power, misfiring or poor fuel economy then its probably tie for a tune-up. After a tune-up your vehicle will run smoother and save you money on fuel. Another indication you may need a tune-up is if your check engine light is on. At Eli and Gary's we will diagnose the why the check engine light is on and check your engines performance to see if any engine components should be adjusted or replaced. 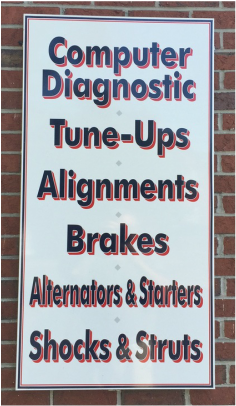 Schedule A Car Tune-Up Today! Think you might need a tune-up or worried about that check engine light? The stop and let the tune-up technicians at Eli & Gary's take a look or call (781) 321-0880 to schedule a tune-up for your vehicle. For your convenience we are open 6 days a week and conveniently located at the corner of Salem and Beach Streets just blocks away from Route 99 (Broadway) and Route 1.